The southernmost part of Velebit, from Mali Halan to the Zrmanja River, extends for 40 kilometers in northwest to southeast direction. 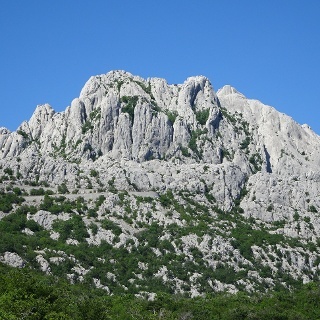 Given the fact that the main ridge gradually takes an eastward turn, simultaneously leaving the sea coast, some geographers consider it a special, southeastern part of Velebit. 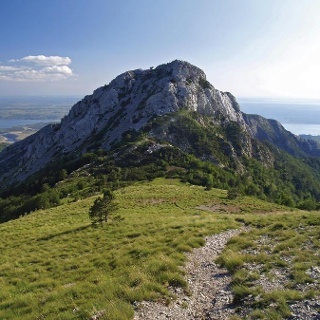 The area south of Sveto brdo is in fact a spacious karst plateau with fairly irregularly scattered rocky peaks. Among them, we see a longitudinally placed, irregularly shaped, wide and undulating valley of Duboke Jasle. Uniquely beautiful rocky peaks of Tulove grede capture particular attention in this area, as they are visible and recognizable from afar. East of this section and the mountain pass Prezid, the only remaining peak area is Crnopac – the last area where the mountain of Velebit reaches substantial heights prior to its end in the canyon of the Zrmanja River. The key access route to the area of Tulove grede is the old road Lovinac – Obrovac across the Mali Halan pass. The easiest way to reach it is from the direction of Obrovac (a signpost at the intersection points to Sv. Rok). The road passes right above the entrance to Sveti Rok tunnel (access from the parking lot next to the tunnel is not possible, since the motorway is fenced off), and then it ascends in bends next to the small church of St. Francis to Vrhprag, which represents the easiest access to the peak of Tulove grede. 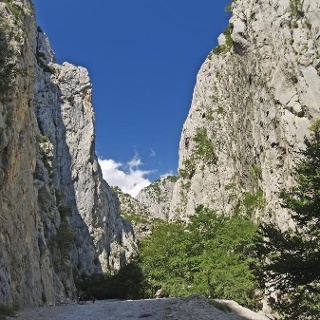 The best connecting hiking route between the Paklenica National Park and Tulove grede is a road in poor condition leading from Veliki Libinj to the locality Kraljičina vrata (Alanac) on the Obrovac – Lovinac road. The area of Tulove grede has been affected by war, but the key paths have been checked and cleared of mines. Despite that, however, several zones in the area of Mali Halan are still marked as mine suspected areas, so they should be avoided. A regularly updated map of mine suspected areas in Croatia is available at www.hcr.hr. Even though the Velebit ridge in the area between Tulove grede and Prezid naturally overlaps with the layout of the Via Dinarica White Line, this zone has no marked longitudinal hiking trails or other infrastructure. Due to mine danger, there is also no alternative route for this section of the trail, so the only currently available option is to use the road descending from Tulove grede via Podprag towards Obrovac, and then to continue along the state road leading from Obrovac to the mountain pass Prezid and to the town of Gračac. Once mine danger gets eliminated, the route towards Ćelavac and Prezid will be connected via Dolac pod Tulom, Lipovača, Gornja Lađa and Čeber, or from Kraljičina vrata via Torine, Mislensko bilo and Jaslensko bilo. We wanted to avoid camping in area between M. Alan and Prezid, so we hiked from Sveto Brdo to Dušice and slept there at the hut (recently renovated, PD Belveder taking great care), water is cca 15 min from the hut. Next day we hiked from Dušice via Mali Alan to Prezid and Crnopac. We followed road and forest roads most of the time, easy navigation, easy hike. There is one spring Crveni potoci just after you turn from Mali Alan road. Then there are some houses and we found one water well. I was scared of hiking this section, but there is no reason. The only mine area is around forest road from Dušice to Mali Alan - clearly signposted and the road is used a lot by people and cars. Just stick to the road. After Crveni potoci to Prezid - this looks like area where life is coming back - logging, cows, ranches, jeep photo safaris. Also nice views of Sveto Brdo.